Non-alcoholic White Wine combo pack includes: One bottle of Ariel Chardonnay, One Fre White Zinfandel, one Fre Moscato, One Fre Brut Sparkling Wine, one Fre Chardonnay and one Chateau De Fleur Champagne Champagnette. All 6 bottles are 750ml in size. The Chateau De Fleur Champagnette has 0% alcohol. It is 100% sparkling fruit juice with similar mouth feel to sparkling wine. The Ariel and Fre items contains less than 0.5% alcohol by volume. They started as wine but has had it's alcohol content gently removed. 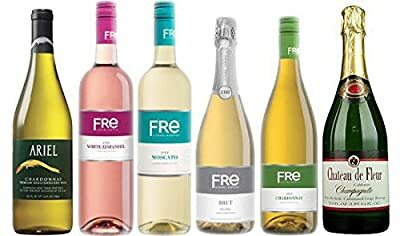 Non-alcoholic White Wine combo pack Includes: One bottle of Chateau De Fleur Champagnette, One bottle of Ariel Chardonnay, One Fre White Zinfandel, one Fre Moscato, One Fre Brut Sparkling Wine and one Fre Chardonnay. Non-alcoholic yet full flavored All 6 bottles are 750ml in size Contains less than 0.5% alcohol by volume. Chateau De Fleur contains 0% alcohol.